In the generation I see, that the 3 cases with char, int and float are not allowed with Double Generic. The other 2 are error highlighted. Are these checks just missing, should I do them myself? Each of this types can be implicit converted into each other except the ArrayType and the StringType. Yeah I'm aware of that, still it would be nice to have a warning that these types need to be casted. 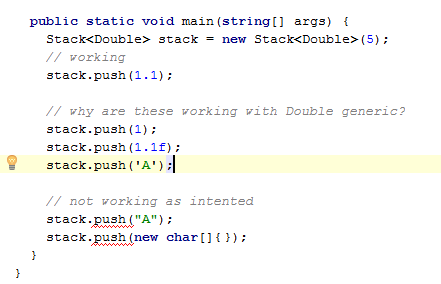 Till now you only notice the problem when generating the code. But thanks, it's probably designed this way.